During my secondary school, I studied the science subjects: physics, chemistry, and biology. The main theory I know about the physics is: Energy cannot be created or destroyed, it can only be transformed. Then I asked, where does energy come from? Is it existed in the beginning? Then, about the chemistry, which studies about the matter. From this subject, I know an atom consists of proton, neutron, and electron. We can determine the element based on the number of protons. Then I asked, what determines the number of protons? There should be some attractive force, but where does this attractive force come from? Then, about biology, my biology is the poorest among the the three subjects. The main theory I know about biology is the DNA. Even the plants and animals have a very distinctive biological system, both of their DNAs consist of same bases: A, C, G, T. And my text book written, this indicates that both plants and animals have a same creator. Even these are the science subjects, these subjects helped me grow more in spirituality. We are living in a world with 3-dimensional space: width, height, and length. 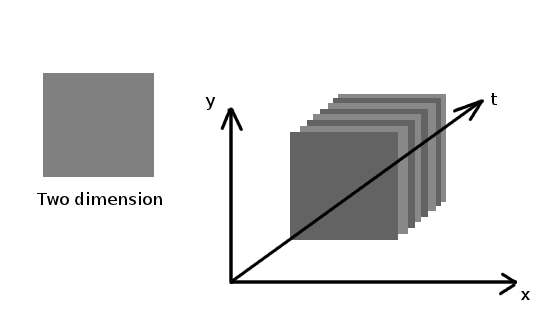 A point is zero dimension; a line is one dimension with length property; a rectangle is two dimensions with width and height properties; a cube is 3D with width, height, and length properties. So, how is the fourth dimension? Normally, we will use time for fourth dimension. Why? Now, if there is a point, with coordinate (x,y). Since it is a point, there is no length, width, or height, thus it is zero dimension. 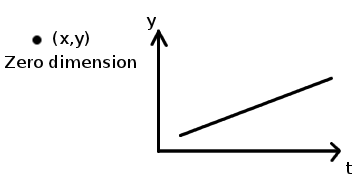 If the point is moving according to axis-y gradually with constant speed, and we record the point with time (t), then we plot the point into a graph, it will become a line as the right side of the image above. Therefore, zero dimension becomes one dimension. 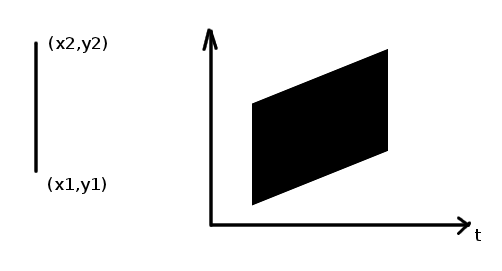 Then, if there is a straight line, as the image above, and the straight line will move according to axis-y, and we record it with time (t), then we plot it again, we will produce a graph like the right side of the above image. Then, we can see that a line becomes a quadrilateral object which is 2D. Next, if there is a 2D object, namely rectangle. We are using the same method as the above examples, record the position of the rectangle with time (t), then we try to plot it. As a result, we will produce something like the right side of the above image, which is something look like cube. From here, we can see that, the properties are width, height, and time. If we plot the time property into graph, it will just like the length property. That is why, the 2D becomes 3D by adding the time. From all the examples above, we can find that, the time can be used as an additional dimension not only to the 3D world, but zero dimension, 1D, and 2D. Therefore, if we use a 3D object, and we record it, then we plot it into a graph, then we will produce a 4D object. However, since we are living in 3D world, we cannot understand how a 4D world look it, thus we cannot represent the 4D object visually. However, if we really want to know how does it look like, we can try to use FFmpeg (software) to convert a movie into a sequence of image files. 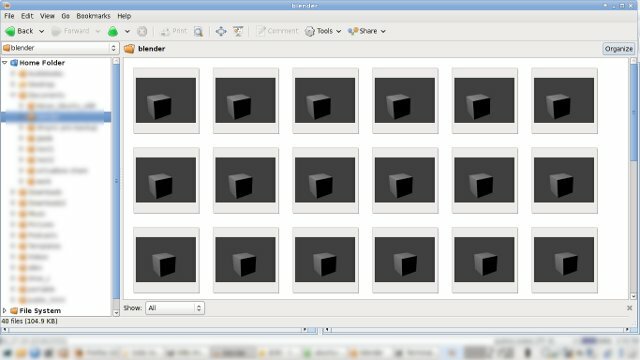 Then, we try to use an image browser to see the thumbnails of all the image files in one glance. Yes, this is how we can see everything in a glance despise the time. Now, let us think about, how does the God, who is beyond the time and space, see each one of us? I am not a creative person. But doing programming lets me think how to become a creative person. We can create a computer with integrating AI (Artificial Intelligence). A low level AI computer will produce a simple pattern, which can be easily learnt by human. A higher level AI will have a more complex pattern. Whatever it is, there is a pattern in an AI. This is because the pattern is programmed by the programmer. For a simple pattern, it is a simple formula. When the pattern is complex, there is a complex formula or consisting of a lot of formulas. Whatever it is, there are formulas which the computer follows. Thus, for a computer to become creative, the computer must not follow the formula, or pattern. The formula is based on logic, thus the computer must not follow the logic. But this doesn’t mean that, the computer needs to negate everything, because negation is still a logic. Thus, to make the computer out of logic, that means the computer should not base on the internal rules (the formulas). That is why, randomness is important. To create a random number, we often use the time seed. This is because only the time is always running, the time is always different. And only using the random, the computer can produce something which is unpredictable, outside the rules. The random is the outer factor which affects the logical processing of the computer. However, time seed will only produce a random number. The random number is only a number for the computer. Within the computer, it also needs to interpret the random number as an input. Then, translating the random number to something significant as the output. Thus, there must be another rule to interpret the random input for the computer. Another rule is used, this is because a computer cannot create anything base on a random input. For example, a computer will print “a” each second. Because of the random input, the computer can print other characters instead of “a”. However, the computer can only print the characters that are already programmed within the computer. The computer cannot create new character by itself. (Machine learning might help the computer generate new character, but machine learning itself is another rule.) Thus, rule is always needed. But the factor (or input) can be either internal or external. Similarly, a human to become creative, he or she must not follow the rules. He or she needs a random input. A random input can be anything around us. A random input can be a whim go through our mind. However, sometimes there are a lot of random input, we still cannot become creative. This is because we do not have the rule to interpret the random input. Maybe, a creative person, they have their creative rule, which we still not yet understand. That is why we cannot create a creative program. After reading an article, “How Teleportation Will Work“, I found that it is very interesting. Since I often dream that I have the teleportation ability. From the article, it says that a photon is possible to be teleported. But the teleportation works by creating a replica of the original photon. After the replica is created, the original photon will no longer existed. That means, the information can be teleported from one portal to another portal. The article also discusses about the human teleportation. This is interesting. Because, it says that, since a human consists of a vast amount of atoms, the replica of the teleportation needs to be exactly precise. Because, one error might cause a grave neurological or physiological defect. You can see, how complex is a human being. You cannot create a human just by collecting all the atoms together. Next point is more interesting. The article states that, the teleportation works like fax machine. When the replica is created, the origin will be destroyed. The replica will have the same memory, same characteristics, same perception as the origin. Since I studied Philosophy of Mind, if you believe “Identity Theory”, which is mind equals to brain, that means, though your original body is destroyed, your mind still exists in the newly created replica. That means, if you believe that the brain is equal to mind, you will try to use the 100% functioned teleportation technology. If a person who experienced the teleportation technology tells you that it doesn’t affect his or her mind, you should know that, the replica is exactly same as the origin. No one can access the other’s mind. So, you still don’t know whether the replica has the same mind of the origin or not. The only solution is experiencing it by yourself. But nobody will know the effect. I just wonder, is there any other method besides this replication method? I always think that, may be one day, we can perform something beyond the 3-dimensional space. How does it work? When we draw a picture, the picture is 2-dimensional space, with only width and height. Since we are in the 3-dimensional space, we has depth. As a result, we can draw at any point (2D coordinates) of the picture (2D space). That means, if we have the ability in the 4D space, we can access any 3D coordinates of the 3D space. Therefore, the teleportation will work. According to Shichida Makoto (七田真), adults’ brain wave is different from children’s brain wave [Click here to read more (chinese)]. That is why adult cannot use diencephalon to perceive like a child. The followings are my opinions and assumptions. 1. When we were young, we might use the diencephalon (middle brain) to perceive. However, because most of the time, we are using the basic five sensory systems. Later by later, we didn’t use the diencephalon to sense or to perceive. Then we forgot how to use it anymore, or the diencephalon cannot function like before because it is weaker and weaker. Just like if we never do the physical exercise, our body becomes weak. 2. May be, diencephalon is still functioning, and still sensing. However, because of the perceptual organisation, we cannot give the meaning what we had sensed. Because since we are adult, we have a lot of knowledge in our mind. If you understand chinese characters, surely each character provides meaning to you. For those who don’t know chinese characters, these characters just like images with some strokes to them. For those who know chinese characters, they cannot pretend to not understand, because they already understand these characters. 3. Similar to the first assumption. We don’t know how to pay attention to the diencephalon. For example, when we are listening to the music, we might close the eyes and pay attention to what we are listening. But, when we are focus in doing calculation of a difficult mathematics, and someone is calling you, you might not heard it. But your audio sensory is still functioning. So, our diencephalon might still functioning, but we don’t know how to pay attention to the sensory input of the diencephalon. Our brain may be processing too much on other sensory inputs. Just some questions, why most of the humans cannot use diencephalon? Is this the ability which needs to be surpressed innately due to some reasons? So, is it really good to use the diencephalon to perceive? I am interested in qigong (氣功). And I read some books, said that meditation (靜坐) can open the inner power (人體潛能, don’t know how to translate). This includes open the eye of the forehead (開天眼). Maybe the eye of the forehead is just the diencephalon. So, I still think that, the adults are possible to use the diencephalon to perceive like children. If I never heard it, I don’t know; if I never see it, I don’t believe. My relative’s child, attended a course. That course can help the children to open their “diencephalon” (middle brain, or inter brain). Why open it? When the children are blindfolded, they still can “see”. We asked the girl to demonstrate the ability: we blindfolded her. Then, put a lot of blue and read small balls inside a box. Then we asked her to take out all red balls. She could take them out. Not only that, we used a children book, which contains a lot of picture with english name, and randomly opened a page, put in front of her, she touched, and she knew what is the picture, even the colour. She was still blindfolded. Too mysterious. Asked her how she knew, she said she can “see”. But, if we blocked her forehead and above her forehead, she said she “cannot see”. Too mysterious, cannot understand. And they say the course is for children only. And I heard that, adults cannot open their “diencephalon” like children. Yes, so interesting… I like the theory about Mayan calendar. Because Mayan calendar can count from about 10 thousand years BC, but the final years is 2012 AD (or CE, common era). So weird.